Roofing is measured by the square. A square is a 100 square feet. This includes the shingles, cap and starter course. 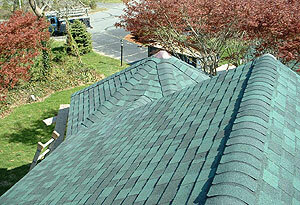 Roofing has a base price for labor and materials. The price cost increases with the degree of difficulty for skylights, valleys, height changes, roof pitch, staging needs and number of layers. A square of shingles typically is three bundles per square for the thirty year product and four bundles for the forty year product, this is manufacturer dependent. After I have laid down protective tarps, set my staging and stripped the existing roof now is the time to start the installation of your new roof. The first step is evaluating the condition of the roof sheathing (plywood or boards). If it is determined to replace any now is the time. Next I nail all the sheathing with galvanized nails to the rafters. I install new drip edge at the beginning of the roof (white, mill, plain or vented). I install a three foot strip of water and ice barrier to minimize the ice dam penetration of the roof (www.iko.com). I paper the whole section with thirty pound felt/tar paper, most guys just use fifteen pound. I have also used the synthetic underlayment (www.typar.com, www.graceathome.com). The roofing products that I am most confident using is the CertainTeed Landmark and Woodscape Architectural Series (www.certainteed.com). I prefer to six nail my shingles rather than the standard four nail arrangement, with 1-1/4 pneumatically fastened roof nails. This adds 50 % more holding power against those constant Cape Cod winds. I replace the 2 and 3 pipe flanges on the roof. I use products from The Neverleak Company (www.neverleakcompany.com). I like to increase the building ventilation at the peak with a ridge vent (www.gaf.com). Last, but not least, I clean up all the shingles that have fallen into the tarps. I use a container service offered by a local company (www.robertchildsinc.com). Finally, I walk around with a large magnet picking up any hidden roofing nails. Congratulations, you just had a new architect roof system installed on your Cape Cod home!